FILE - A voter puts on an "I voted" sticker during the U.S. presidential election in Philadelphia, Pennsylvania, Nov. 8, 2016. Pennsylvania's high court issued a new congressional district map for the state's 2018 elections on Monday, potentially giving Democrats a boost in their quest to capture control of the U.S. House unless Republicans can to stop it in federal court. Democrats quickly cheered the new map, which could dramatically change the predominantly Republican, all-male delegation elected on a six-year-old map. The new map repackages districts that had been stretched nearly halfway across Pennsylvania back into compact shapes and reunifies Democratic-heavy cities that had been split by Republican map drawers. Democratic Gov. Tom Wolf, who had backed the court's decision to throw out the six-year-old map, lauded the court's "effort to remedy Pennsylvania's unfair and unequal congressional elections," and he said his administration will work to update elections systems for congressional races. FILE - A voter leaves a polling booth during the U.S. presidential election in Philadelphia, Pennsylvania, Nov. 8, 2016. It's the first time a state court threw out congressional boundaries in a partisan gerrymandering case. Registered Democratic voters and the League of Women Voters originally sued last June. Republicans who controlled the Legislature and the governor's office after the 2010 census crafted the now-invalidated map to elect Republicans and succeeded in that aim: Republicans won 13 of 18 seats in three straight elections even though Pennsylvania's statewide elections are often closely divided and registered Democratic voters outnumber Republicans. Meanwhile, sitting congressmen, dozens of would-be candidates and millions of voters were beginning to sort out which district they live in barely a month before the candidates' deadline to submit paperwork to run. Republican Rick Saccone, left, and Democrat Connor Lamb before the taping of their first debate in the special election in the Pa., 18th Congressional District at the KDKA TV studios, Feb. 19, 2018, in Pittsburgh. 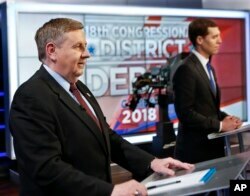 The new map will not apply to the March 13 special congressional election in the 18th District between Republican Rick Saccone and Democrat Conor Lamb for a seat left vacant by Republican Tim Murphy's resignation amid an abortion scandal.